As modern technology began to grow and expand in different levels, such as Display Screens, whereas the evolution global electronics sets foot into touch screen devices. 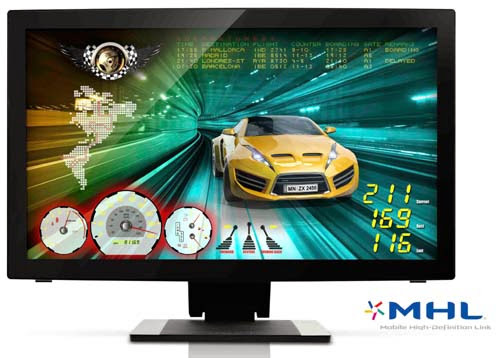 These touch screen displays can be used any many factors and situations. As for daily usage, ranging from Smartphones, Tablets, and now even big touch screen displays once you see inside the mall or customer inquiry booth. ViewSonic has incorporated innovative touchscreen technology into the whole new 21.5-inch TD2240 and 27-inch TD2740 10-point projected capacitive touch screen displays, in order to pioneer in visual technology innovation and offer a full line of touch screen displays. The 21.5-inch ViewSonic TD2240 and the 27-inch TD2740 Full HD displays come equipped with 10-point projected capacitive touch screens. The TD2740 equipped with a 1.0MP front webcam and a microphone delivers a versatile solution for use in the office or at home, as well as for use as an information kiosk in public areas, or as a teaching tool in interactive learning environments. Besides, integrated with Mobile High-Definition Link (MHL), the TD2240 enables users to display mobile devices directly to a larger screen without the need for a PC. For additional convenience, the batteries of mobile devices are charged while connected via MHL. The bookstand design of ViewSonic TD2240 and TD2740 provides advanced ergonomics and allows the display to be tilted, or laid flat on a table top, for more comfortable use. Paired with SuperClear technology with ultra-wide viewing angles, the TD40 series brings greater definition and clarity to multimedia content. ViewSonic TD2240 and TD2740 breakthrough the limitation when using a touch screen and bring in the excellent visuals for ultimate entertainment experience. Projected Capacitive is one of the leading touch technologies that allow users enjoy a smoother and more accurate touch display experience with increased interactivity. With its 10-point multi-touch technology and a durable, scratch resistant surface, the TD40 series offer a highly accurate and ultra-responsive touch experience—whether for web-browsing, gaming, typing, or applications execution. The TD2740 includes a pair of integrated 2W speakers, a 1.0MP front webcam supports HD video quality, and a microphone for video conferencing with internet access. Easily connect with colleagues and friends for work or play. TD40 series feature a 1920 x 1080 Full HD 1080p resolution for incredible pixel-by-pixel image performance. You will experience amazing clarity and detail whether you are working, gaming, or enjoying the latest in multimedia entertainment. SuperClear technology provides viewers with a 178°/178° wide-viewing angle and consistent color performance. The technology eliminates image distortion and color shifting, even at extreme angles. The touch display is constructed with a 7H hardness protective glass which provides increased scratch-protection to deliver the safest and most durable touch experience. It prevents any heavy damage caused by fingers, nails, or styluses during touch operations, making it ideal for use in kiosks, educational settings, or other public environments. Integrated with Mobile High-Definition Link (MHL), the TD2240 enables users to connect compatible mobile devices, such as smartphones and tablets, directly to the TD2240 display. This allows digital content from mobile devices to be viewed in stunning Full HD resolution on the 22-inch screen of the TD2240. For additional convenience, the batteries of mobile devices are charged while connected via MHL. ViewSonic’s TD40 series is equipped with a HDMI port and DisplayPort digital interface to support signals from set-top boxes, Blu-ray players, and Full HD camcorders and deliver Full HD images. ViewSonic’s TD2240 features a 4-port USB 3.0 hub to provide easy connectivity for a wide range of storage devices, computer peripherals and high-definition electronics. *Disclosure: An important note, we are just sharing this information to the public, provided by our source (Image Media Phils). 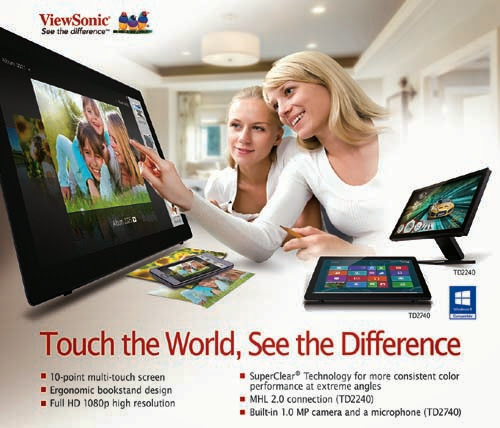 ViewSonic Info / Logos / Photos / Images has respective copyrights. can i used this on games such as if have an android box, then i used this as my display device?